When I was a boy (and of course, I still am one) I had a childrens encyclopedia with pictures comparing the landscape before the advent of mankind, followed by stone-age times, pre-industrial times and modern times. The mountain areas of Mongolia remind me strongly of those pictures of pristine, unspoiled landscapes with never a soul in sight  just animals dotting the low-lying areas and eagles wheeling in the sky. My first stop on this trip was to return briefly to Beijing for an exchange session with archers and bowyers connected to the Chinese Archery Association. This ATARN activity was arranged by the Vice-Chairman of the Association, Mr Xu Kai-cai, who is an active ATARN member. 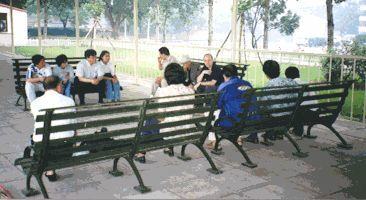 A meeting with Members of the Chinese Archery Association in Beijing, June 1999. In our discussion, I outlined my research on Chinese archery technique and my thoughts on the implication of traditional technique for the design and construction of traditional Chinese bows. We agreed to work together to source original bow-making materials and to encourage the re-establishment of the old bow-makers craft. The annual Nadam festival (11 July) starts soon, and the archers of the Mongolian National Archery Federation (also ATARN members) were busy practicing. As you would expect, Munkhtsetseg was at the archery line practicing for several hours each day. She has won the Nadam championship in Khalkha archery style six times, and is working hard for the title again this year. She is the first woman to have been awarded Mongolias highest title in archery  Mergen  meaning archery champion. She wears a special badge on her hat in recognition of her achievement. At the practice lines for the Nadam, I came across a form of Uryankhai (West Mongolian) archery for the first time. I have named it dumb-bow archery because it features a form of bow which can only be described as virtually un-manageable. 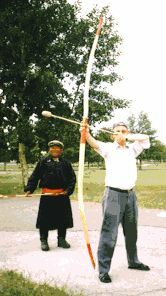 I quickly ascertained with a local expert that this form of bow  an enormous self longbow 2.5 metres in length  has no virtue other than being difficult to shoot. No-one regards them as superior to the traditional Mongolian composite bow like the one being drawn in the photograph of Munkhtsetseg. As I have said, the bow is 2.5 metres in length, made from a single piece of birch trunk, and strung with a hemp cord. I think the draw-weight was 50# - 60#. The target is a group of fist-sized balls made of woven leather placed on the ground 40 metres from the shooting line between two earth ridges about 5 cm high and 2 metres apart. 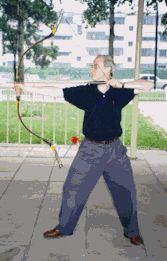 The aim of the competition is to use this difficult bow to shoot an arrow at the target ball, so that the ball is knocked out over the second earth ridge. The arrow can hit the ball either directly, or after sliding along the ground, but the arrow must stay within the ridges, with only the ball being knocked out. Uryankhai target balls are about 10 cm in diameter, and were originally made of knotted horse bridles. The string binding them together is removed during the competition. 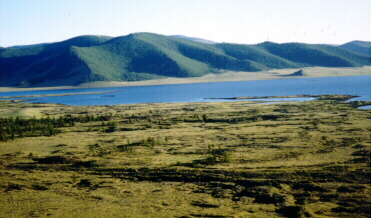 Dulaankhaan is a small village in the north of Mongolia, in Selengge Aimak, which used to be based around a large wood-processing station. The purpose of my visit (seven hours by jeep overland from Ulaanbaatar) was to visit the bow-making factory of Boldbaatar. Boldbaatar is the son of Mongolian archery champion, Sukhebaatar. 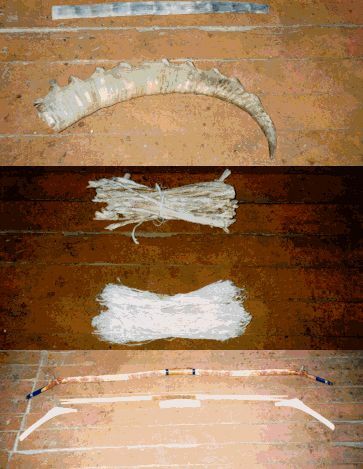 They started to make bows on a commercial scale (12 per year) in 1995, based on traditional knowledge of the bowyer Choijelsuren (father of Munkhtsetseg.) Their workshop, in a small, permanent building, produces bows in mens, womens and childrens sizes according to the Khalkha style of bow called Gung. Completed bow above, and pre-cut bamboo/birch-wood assembly below. The materials in the photo above are glued with fish glue made from the air bladder of the croaker fish. 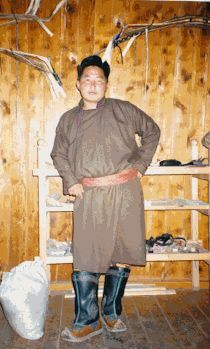 Traditionally, Mongolian bowyers have used water buffalo horn from China; but now it is unavailable so they have fallen back on using ibex horn. But this material is not favored, partly because its quality is not so good, and partly because there is a risk it will be listed as an endangered species and become unavailable. ATARN will now work to restore a supply of water buffalo horn from China. To increase their revenue, I have recommended that the factory starts to manufacture the prepared components above (with water buffalo horn instead of ibex horn) as pre-cut kits for sale in the West. I hope to bring some to the US in 2000. So start honing up your composite bow-making skills now. Any offers for helping to prepare the instruction manual?